Mayor John Tory has penned a letter to the federal government to inform officials that the city’s overcrowded shelter system can longer accommodate new refugees or asylum seekers without help. In the letter, obtained by CP24 on Tuesday, Tory said while he and city council have been “clear” that they welcome newcomers who want to call Toronto home, there is simply no more shelter space available. The mayor is calling on both the federal and provincial governments to provide the city with immediate assistance to deal with the situation. “Our city has a long history of welcoming newcomers and continues to express our support for your government’s policies related to the welcoming of refugee and asylum seekers. But responsibility for these populations does not end at the border, and we simply can no longer contend with their housing needs alone,” Tory wrote. The mayor said not only is there no room to house new refugees, but hundreds of refugees temporarily housed at dorms at Humber and Centennial colleges will have nowhere to go when they are forced to vacate the facilities as students return in August. Currently there are 600 refugees and asylum seekers housed at the dorms, including 200 children. Two hundred more people are expected to fill the remaining spaces shortly. “Moving just this population of 800 (there are more than 3,000 refugees and asylum seekers in the Toronto shelter and hotel programs) would require the emergency closures of multiple community centres in neighbourhoods across the City and the cancellation of public programming – a step the City is not prepared to take,” Tory continued. A staff report, which will be discussed at this week’s city council meeting, says the city’s direct cost to house refugee claimants and asylum seekers in 2017 and 2018 is projected to exceed $64.5 million. Tory’s letter states that while the city is “thankful” for the federal government’s announcement that $11 million will be made available to Ontario to help deal with the issue, no details have been provided. Speaking to reporters at city hall on Tuesday, Tory said his appeal comes after “months and months” of private conversations with federal and provincial officials. The mayor said the city needs “more than money” from the upper levels of government, which he said need to take responsibility for finding new housing for refugees. “We are not saying we want to offload this responsibility to somebody else. We are saying we want a partnership where all three governments take this responsibility on with us,” Tory said. He also called for the opening of a “triage centre” to manage the flow of refugees, similar to the system that already exists between the federal government, the province of Quebec, and the city of Montreal. Tory said anecdotally, he has heard of other areas outside Toronto that are willing to house and employ eligible refugees. 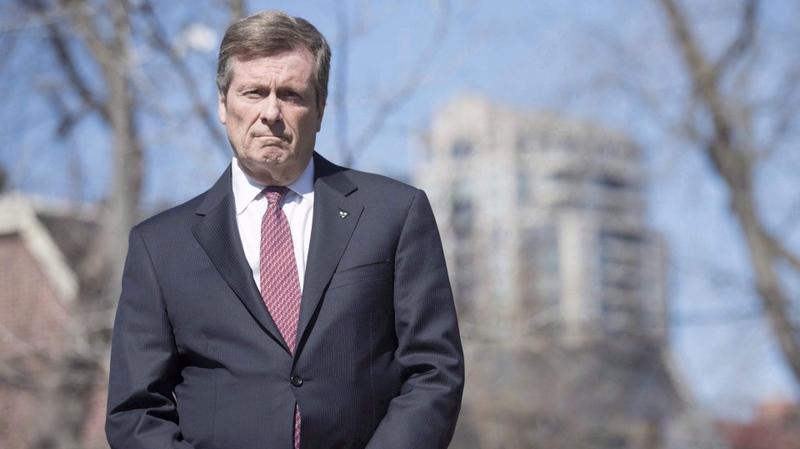 “Even since I began to discuss the issue publicly in recent weeks, I have received information myself about the existence of opportunity and housing outside the city of Toronto,” Tory said. The staff report says that despite an “exhaustive search” for more shelter spaces, no appropriate sites have been found in Toronto. “All the more concerning is the fact that, historically, the flow of refugee/asylum claimants has increased significantly towards the end of June,” the report reads. The mayor has invited federal officials to visit the Toronto hotels or dorms to see where refugees are being temporarily housed. “We haven’t had any response to that as of the moment,” Tory noted.